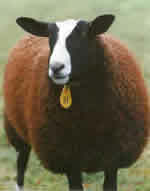 These coloured sheep were introduced to Britain from Holland in the 1980’s. They are a striking, large black sheep with a white blaze from crown to nose. They have up to four white socks and a white tip to their undocked tails. Zwartbles sheep are very maternal and prolific. They are extremely milky and can suckle twins and triplets with ease. Lambs grow at a tremendous rate and have lean meat. The fleeces are of good quality, with plenty of crimp and lovely shading from brown to black. The Zwartble fleece is medium to fine with excellant crimp along the length of fibre. It ranges from dense black to chocolate brown with sunbleached tips. Many fleeces have fine silver hairs dispersed throughout the wool which gives a lustre appearance when worked, though it is not a lustre fleece. Older ewes have white hairs on their quarters but this is not kemp.